Sea-Legs are the world's original portable hydraulic pontoon lift. The product consists of two hydraulically operated lift modules (or Legs) that are attached to the bottom of the pontoon deck. The Legs lift and hold the boat at any height, up to six feet, from the lake or river bottom. When fully retracted under the deck, your pontoon is fully functional until you get to your next destination. 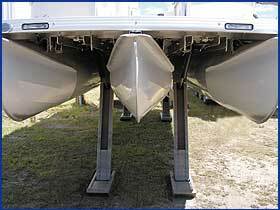 Sea-Legs will fit on most 18 to 30 foot standard, new or pre-owned, pontoon boats. They are designed to optimally function on pontoons that have an 8.5' wide deck and 25" pontoons; however, 8' wide decks and smaller diameter pontoons can be accommodated. 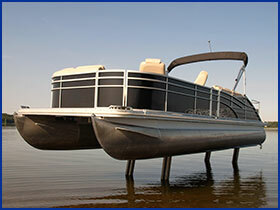 Sea-legs also has a Triple tube version that works on most all triple tube pontoons 22-35 ft. in length. Two heavy duty hydraulically operated lift modules provide up to 6500 pounds of lift capacity. Two large 18-inch x 48-inch pads support the pontoon on lake bottom. In retracted position, legs tuck neatly within 5 inches of pontoon deck; works with any pontoon trailer, no drag while in water. Four heavy duty hydraulically operated lift modules provide over 10,000 pounds of lift capacity. Four large 33-inch X 7-inch pads provide maximum support on any lake bottom. Triple tube Sea-Legs are designed to always have two modules running at all times. Sea-Legs are operated by either remote control or directly, via toggle switches located near the pump. No drifting, no anchors, no banging against the dock.